ideology, exploiting and reinforcing anxieties over race, gender, sexuality, and class and bringing them into the service of nationalism, [W]hite supremacy, and heterosexism, […] under cover of a new phraseology. 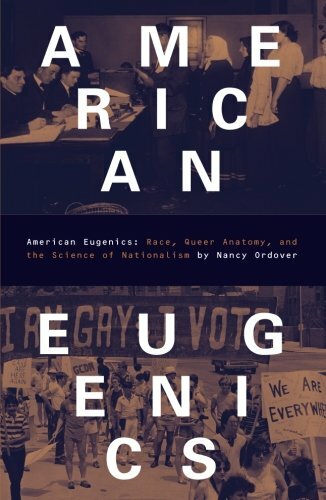 American Eugenics provides a critical view of eugenicists' notions of the most vulnerable groups in the United States through analyzing eugenicists' efforts in biological science, statistical methods, and influencing cultural assumptions. This short book that divides twenty chapters into three parts with a detailed bibliography is another contribution to critical theory examining issues of race, gender, class, and immigration. Ordover, however, focuses exclusively on eugenics to show the role it has played and plays in American society. It combines the views of well-known eugenicists, politicians, academics, social activists, and scientists. Her approach of combating eugenicists' views is influenced by her own views that eugenics "scapegoat[s] and calls it sound public policy" as well as "it defends a violent status quo as a viable political strategy" of presenting eugenicists' views and explaining the fallacies inherent with these views. The book begins with a descriptive account of how eugenics has validated discrimination. Ordover points out that eugenics is ongoing in the mainstream society as evident with the Bell Curve and California's Proposition 187 that legitimatizes and promotes mythical ideas of genetic inferiority predisposes certain groups to the underclass of American society. She then retraces the inaction and adherence by liberal and feminist organizations to eugenic measures like race and class based sterilization policies. In the first section, Ordover examines the eugenicists' efforts to promote race and nationality concerns to advance its goals. This section focuses on the history of American immigration policy as well as sets out the nature of eugenic research and, probably most importantly, outlines why eugenic policies have succeeded and failed. She shows that the eugenicists have succeeded in gaining acceptance of their portrayal of "immigrants and their children as inassimilable foreign bodies, as polluters, as both infected and infectors." She views the immigration legislation and laws as examples of how eugenics can impact the federal and state governments, claiming that through the use of persuasion, communication, money, and research eugenicists are able to use both their reputation as expert agents and their widely respected positions as an 'honest broker' merely representing the best interest of the United States. Their status as defenders of United States' interests allows eugenicists to take a leading role in defining those who should be deemed worthy to be citizens and to continue to strive towards the ultimate eugenic objective: "more exhaustive race-based enactments." [b]asing a struggle civil and human rights on the biological fixity of homosexuality ultimately does a disservice to the LGBT community. History reveals how dangerous such tactics have been to all marginalized groups, how often scientific hypothesis has acted as defender of the social, economic, and political status quo. Then in part three, Ordover recognizes sterilization as the most pervasive eugenicists' measure to defend the status quo. It could "fit easily into a larger history of genocide, threatening a 'gentler' form of eventual eradication." She cites infractions at Indian Health Services that sterilized up to "42 percent of women of childbearing age and 10 percent of the men" and "20 to 30 percent of the doctors" at the Los Angeles Medical Hospital that "aggressively pushed" sterilization on women as well sterilized Chicanas against their will or without their knowledge. According to Ordover, the eugenic belief in sterilization of the "unfit in the United States" is a racial based ideology described as for the "betterment and protection of the [W]hite race." At the same time, sterilization is a punitive measure targeting the incarcerated, the institutionalized, and the poor. In spite of being distinguishable from their predecessors new and temporary sterilization methods have similar goals: to control or reduce the population of minorities and the poor and thus to be able to shape society to along the lines of eugenicists' ideals. Ordover exposes eugenicists' methods and notions that cloak their objective of ethnic cleansing. This represents a compelling review of the conceptual, methodological and practical shortcomings of the often self-described melting pot of the United States. It is an account based on eugenicists' attempts to solve social problems by attacking vulnerable groups and preserve their mythical gene pool from being undermined by intrusion from these groups. It may be a mistake to turn to this book with an expectation that it will provide the answers to dealing with the problem of prejudice presented by groups like eugenicists, but her account shows that to ignore their practices will be "at our own peril." As such, American Eugenics is an insightful read for any person seeking to better understand the nature of eugenics and the culture that allows it to flourish. Aaron Peron Ogletree holds a Juris Doctor from University of Minnesota Law School. He also holds a Bachelors of Arts degree in Honors-Political Science, University Honors, and International Studies from Wayne State University.